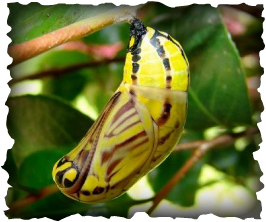 "One day a small opening appeared in a cocoon, a man sat and watched the butterfly for several hours as it struggled to make its body through that little hole. So it seemed to stop making any progress. It seemed that she had gotten as far as it could and could not go on. So the man decided to help the butterfly: he took a scissors and cut the cocoon. The butterfly then emerged easily. But her body was withered and small, and she had shriveled wings. The man continued to watch the butterfly because he expected that at any moment, the wings would enlarge and expand to be able to support the body which would become strong in time. Nothing happened! In fact, the butterfly spent the rest of its life crawling around with a withered body and shriveled wings. She was never able to fly. What the man in his kindness and haste did not understand was that the restricting cocoon and the struggle required for the butterfly to get through the tiny opening was the way that nature caused the throttle body fluid to be their wings so that she would be ready for flight once it achieved its freedom from the cocoon. "